UNITED NATIONS: Pakistan has expressed support to any Organisation of Islamic Cooperation (OIC) initiative that is being put forward to ease the difficulties of the Palestinians and has criticised the failure of the UN Security Council (UNSC) to condemn the deadly violence by Israeli troops in Gaza against the Palestinians. During an emergency meeting of the OIC ambassadors held at the United Nations, Pakistan’s permanent representative Maleeha Lodhi stated that one country has blocked the unanimous call of the other 14 members in the Security Council, to issue a statement merely calling for an independent investigation into the incidents. 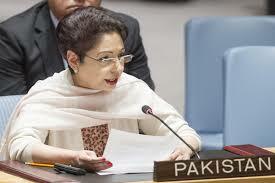 It had further been reported that Pakistan will observe “Palestine Solidarity Day” on May 18. Earlier, PM Shahid Khaqan Abbasi directed the day to be observed across the country. “The government and the people of Pakistan would continue supporting their Palestinian brethren and present their case at every forum,” a statement said quoting the prime minister. The day is aimed to demonstrate complete solidarity with the Palestinians in wake of Israeli troops killing dozens of Palestinians during clashes and protests along the Gaza border against the US embassy opening in Jerusalem on Monday – the conflict’s bloodiest day in years. In the bloodiest single day for Palestinians since 2014, Palestinian Health Ministry officials said more than 100 protesters were killed and 2,700 injured by live gunfire, tear gas or other means used by Israeli troops.